NOTE: The following story was taken from the blog of Bob Speelman, president of Atlas Healthcare Solutions. Each week Bob works as an STNA at one of his facilities in order to better know his company's motto -- Supporting Superior Care. I spent yesterday at Tuscany Gardens, our beautiful 123-bed skilled nursing facility in Pataskala, Ohio. 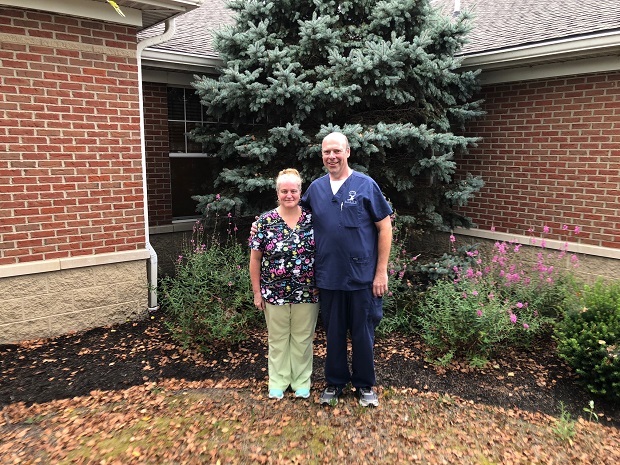 The administrator at Tuscany Gardens, Brian Duval, set me up with an awesome caregiver to spend the day with – Marcie Campsey. Marcie is a 48 year old mother of three, and has a four month old grandbaby. She’s been a nursing assistant for 20 years and taking care of people comes as natural to her as breathing. She’s simply a gem. Marcie is at Tuscany Gardens a lot due to the STNA shortage that the entire nation is experiencing. She was the perfect person for me to get to work alongside, and she helped me understand how this journey I’m taking as an STNA is helping us inspire others with the Atlas mission. See, Marcie became a caregiver through the encouragement of her grandmother who was a nurse in the Army. At first, Marcy thought this would be her career path, too. However, she soon learned that her calling is directly caring for residents as an STNA. Marcie’s explanation of her calling was simple – “My residents need me and I need them.” She was right, too. Yesterday, she entered work having a bad day, and a hug and a kiss given to her from a resident cheered her right up. Marcie loves her people and they love her. It’s a beautiful thing. Have you ever had someone in your life that just loved you for you? I’m talking pure and simple love. No judgment. No expectations. Just love. Marcie has that kind of love for her residents. She even has a bag of products that she buys with her own money because she knows her residents like them. At one point, after we gave care to a resident, she showed me their photo album. The pictures took me back in time to a young navy man who helped defend his country. To a husband who worked and sacrificed to make a better life for his family. This is the man that sat next to us. And Marcie loved to take care of him. Marcie saw each and every one of her residents not as they are now, but as their whole life has been, and is today. She loves the whole person, and sees the beauty in everyone. Marcie’s call is to care for her residents. My calling, and the calling of Atlas, is to care for her and all the other Marcie’s out there.